Piers Morgan was born in 1965. He studied journalism at Harlow College, beginning his career in local south London newspapers before being spotted by Kelvin McKenzie of The Sun and given his own showbiz column, Bizarre. Aged only 28 Rupert Murdoch made him Editor of News of The World in January 1994; he was headhunted two years later to edit The Mirror where he stayed until May 2004 when he was sacked following the decision to publish photos of British soldiers apparently abusing Iraqi prisoners of war. Since then, Piers has presented a number of TV shows – including The Dark Side of Fame, You Can’t Fire Me, I’m Famous and Tabloid Tales for BBC1. He shot to fame in the US as Simon Cowell’s straight-talking Brit mate as a judge on the top rated show America’s Got Talent and wowed American audiences to triumphantly win The Celebrity Apprentice. 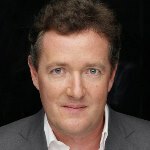 Piers is also a judge on the hit UK show, Britain’s Got Talent. 2009 sawPiers with new series for ITV1 – Piers On… documentary travelogue programmes in which he had VIP access-all-areas pass to some of the most glamorous locations in the world and a chat show, Piers Morgan’s Life Stories, an intimate and revealing interview, celebrating the life and career of leading stars from entertainment, business and politics. His book, The Insider, private diaries of a scandalous decade, became an instant number one bestseller and sequel Don’t You Know Who I Am? Insider diaries of fame, power and naked ambition topped the bestselling list. The next instalment, God Bless America is out now. In addition, Piers writes a regular column for The Mail on Sunday on sports and his diaries appear in their supplement Live Magazine. Today Piers Morgan is presenter on the ITV breakfast show Good Morning Britain. In January 2018 he presented President Trump – The Piers Morgan Interview on ITV.